The slime mold Physarum polycephalum forms a network of cytoplasmic veins as it spreads across a surface. INTELLIGENCE IS NOT a quality to attribute lightly to microbes. There is no reason to think that bacteria, slime molds and similar single-cell forms of life have awareness, understanding or other capacities implicit in real intellect. But particularly when these cells commune in great numbers, their startling collective talents for solving problems and controlling their environment emerge. Those behaviors may be genetically encoded into these cells by billions of years of evolution, but in that sense the cells are not so different from robots programmed to respond in sophisticated ways to their environment. If we can speak of artificial intelligence for the latter, perhaps it’s not too outrageous to refer to the underappreciated cellular intelligence of the former. Under the microscope, the incredible exercise of the cells’ collective intelligence reveals itself with spectacular beauty. Since 1983, Roberto Kolter, a professor of microbiology and immunobiology at Harvard Medical School and co-director of the Microbial Sciences Initiative, has led a laboratory that has studied these phenomena. In more recent years, it has also developed techniques for visualizing them. In the photographic essay book Life at the Edge of Sight: A Photographic Exploration of the Microbial World (Harvard University Press), released in September, Kolter and his co-author, Scott Chimileski, a research fellow and imaging specialist in his lab, offer an appreciation of microorganisms that is both scientific and artistic, and that gives a glimpse of the cellular wonders that are literally underfoot. Imagery from the lab is also on display in the exhibition World in a Drop at the Harvard Museum of Natural History. That display will close in early January but will be followed by a broader exhibition, Microbial Life, scheduled to open in February. The slime mold Physarum polycephalum sometimes barely qualifies as a microorganism at all: When it oozes across the leaf litter of a forest floor during the active, amoeboid stage of its life cycle, it can look like a puddle of yellowish goo between an inch and a meter across. Yet despite its size, Physarum is a huge single cell, with tens of thousands of nuclei floating in an uninterrupted mass of cytoplasm. In this form, Physarum is a superbly efficient hunter. When sensors on its cell membrane detect good sources of nutrients, contractile networks of proteins (closely related to the ones found in human muscle) start pumping streams of cytoplasm in that direction, advancing the slime mold toward what it needs. But Physarum is not just reflexively surging toward food. As it moves in one direction, signals transmitted throughout the cell discourage it from pushing counterproductively along less promising routes. Moreover, slime molds have evolved a system for essentially mapping their terrain and memorizing where not to go: As they move, they leave a translucent chemical trail behind that tells them which areas are not worth revisiting. Moreover, biofilms are not just dense accumulations of bacterial cells. They have elaborate functional structures, inside and out, that serve the cells’ collective destiny, as can be seen in the images below of Pseudomonas aeruginosa. The biofilm is stained with Congo red dye, which bonds to the extracellular matrix proteins that the bacteria secrete as a scaffolding for their community. 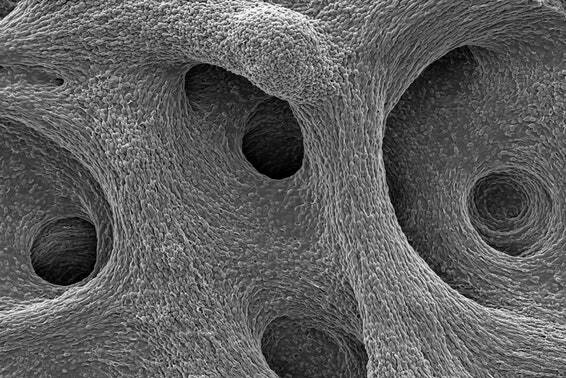 The deeply wrinkled surface of the biofilm maximizes the area through which the bacteria can absorb oxygen; it also probably helps them collect nutrients and release waste products efficiently. Within the biofilm, the bacteria divide the labor of maintaining the colony and differentiate into forms specialized for their function. In this biofilm of the common soil bacterium Bacillus subtilis, for example, some cells secrete extracellular matrix and anchor in place, while some stay motile; cells at the edges of the biofilm may divide for growth, while others in the middle release spores for surviving tough conditions and colonizing new locations. One might wonder why natural selection would have favored this collective behavior instead of more rampant individualism among the cells. 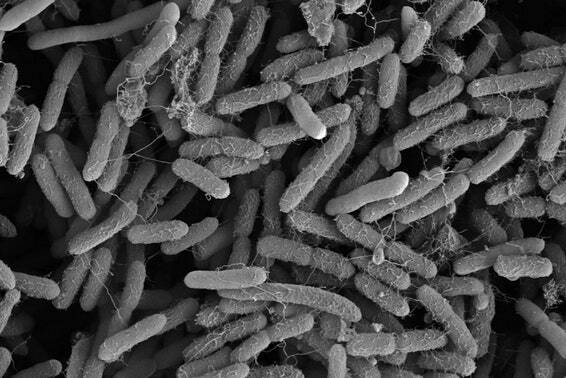 Part of the answer might be what evolutionary theorists call inclusive fitness: In so far as the bacteria within a biofilm are related, individual sacrifices are offset by the increases in fitness to each cell’s millions of cousins. But it may also be that every role within the biofilm has its advantages: Cells at the edge are most exposed to dangers and must reproduce furiously to expand the biofilm, but they also have access to the most nutrients and oxygen. Cells on the inside depend on others for their vital rations but they may survive longer. The surfaces that biofilms grow across are not always solid. These B. subtilis are forming a pellicle—a kind of floating biofilm at the interface between water and air. The genetic pathways involved in forming a pellicle are essentially the same as those used in growing across stones, though they may respond to the changes in their habitat by altering the precise mix of proteins in the extracellular matrix as needed. Expansive growth is not the only way in which microbial communities can move. Below, B. subtilis is engaging in a behavior called dendritic swarming, in which cells rapidly push outward in branching columns that can efficiently pave a surface. Biofilms swarm when they detect that they are in environments rich in nutrients: Swarming helps a biofilm exploit this valuable territory before any competing communities can. At least two important changes in the differentiation of the cells in a biofilm take place to enable swarming. First, motile cells on the periphery of the film develop extra flagellae, which enables them to swim more energetically. Second, some edge cells also begin to secrete surfactant, a slippery material that helps the motile cells slide more rapidly over the surface. When biofilms grow in flat laboratory dishes, the dendritic columns of swarming biofilms remain neatly distinct: They extend and coil in and around one another but they do not cross. That seems to be in part because the surfactant piles up around the biofilm branches as a barrier. Similarly, some bacteria can swarm in more terraced structures under laboratory conditions. What the implications of that option are for bacteria in nature is still a mystery. What’s curious is that the direction of the spiraling migration—clockwise or counterclockwise—seems to be a hereditary trait: Different strains of bacteria, even within the same species, spiral in different directions. It is yet another example of how bacteria, obeying instructions in their individual DNA, can manifest problem-solving behaviors that are surprisingly complex and adaptive at the collective level of biofilms. These geometric and presumably functional patterns that biofilms produce in culture are intriguingly beautiful. Yet Chimileski notes that there is much left to discover when it comes to translating behaviors seen in the lab to natural microbial communities. Chimileski points out that “most natural biofilms are multi-species ecosystems and cells inside natural biofilms usually grow more slowly.” He continued, “I like to think of the way we grow bacteria in a petri plate, where a single species is by itself and has everything it needs to grow at optimal temperatures, as ‘turning up the volume’ on the biology of the organism.” Under laboratory conditions, researchers can study which genes are involved in complex multicellular behaviors and they can measure the benefits to the fitness of the bacterial species. But in natural environments, biofilms don’t usually get to form exactly the same patterns as in the lab because of limited nutrients or competition with other species. “So the same biology might be occurring on a particle of soil in your backyard at smaller size scales and over longer time periods,” he said, even if it is less easy to visualize. Spiral migration is a behavior favored by the highly successful soil bacterium Bacillus mycoides. Communities of these cells expand by forming long filaments of cells that coil either clockwise or counterclockwise—an orientation that is strain-specific and genetically determined. Biofilm behaviors testify to the capacity and openness of bacterial to form collectives—but that openness has limits, as shown in this culture with several cohabiting biofilms. Here, adjacent biofilms that consist of the same bacteria or closely related strains comfortably merge. But the adjacent biofilms made up of more divergent bacteria keep themselves distinct and may even try to eliminate or control each other. Biofilms are so intolerant of other strains and species because they invest considerably in the production of surfactant, extracellular matrix and other molecules that bacteriologists classify as public goods—ones that the bacteria secrete for other members of their community. The bacteria guard these jealously because unrelated freeloading cells could benefit strongly by using them first. Biofilms rebuff such freeloaders in different ways. For example, the B. subtilis colonies in this image adopt a strategy of “kin discrimination,” in which they secrete antibiotic compounds that are toxic to other species but not to their own. Proteus mirabilis bacteria defend their interests in a different way based on “self-recognition”: The P. mirabilis biofilms examine encroaching cells, stab any from a different species with a spearlike structure and inject them with poisons that will kill almost all but closely related species. The colors appearing in the biofilm culture of Streptomyces coelicolor in the video below reflect natural pigments that the bacteria produce. The value of the pigments for the biofilms is not entirely clear, but it is probably not tied to their color. Rather, these pigment molecules are often bioactive in various ways. “The blue pigment seen in this video is actinorhodin, which is technically an antibiotic,” Chimileski said, but added that the term is misleading in this context. “Killing or growth inhibition usually occurs only at very high concentrations relative to what is out in nature.” For that reason, he said, there is “an emerging view that killing is probably not the ecological function of many or most antibiotics. Rather, these bioactive molecules act as signals or developmental cues” to other cells. That view is echoed in a note from Gleb Pishchany, another research fellow in Kolter’s laboratory who studies how diverse types of bacteria cohabit. “An intriguing possibility is that in natural ecosystems, Streptomyces use pigments and other bioactive molecules” at “lower concentrations as signals that are exchanged among multispecies microbial communities,” he wrote. The pigments may help cohabiting assortments of bacteria rein in one another’s less neighborly instincts, and thereby maintain a more cooperative and fruitful communal existence. In this powdery colony of Streptomyces coelicolor, the pigmentation comes from actinorhodin, a molecule with antibacterial effects. Biofilms may use bioactive pigments as signals for controlling the behaviors of other microorganisms in their shared environment. 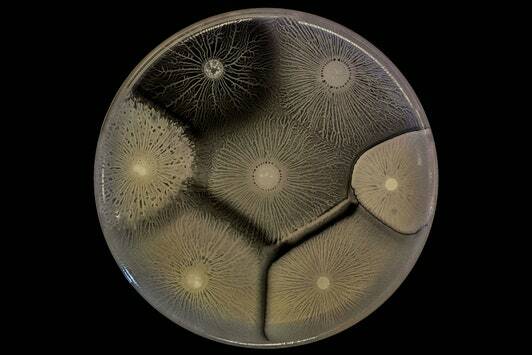 These striking photographs of microbe communities were captured by DSLR cameras. Chimileski collects his still images with macro lenses while working at the bench, while the videos are made in an incubator dedicated to time-lapse microscopy. He sets the camera to snap a picture every 10 minutes, although he increases the frequency to every minute or two for behaviors happening more quickly, such as the movements of slime molds. As a result, the movements of the microbes in these videos are typically accelerated between 5,000 and 50,000 times their actual speeds. Chimileski does not use false color to beautify the images: Aside from using dyes to stain the extracellular matrix in some cultures, he shows the natural coloration of the microorganisms. Chimileski typically grows bacterial colonies at 30°C, a temperature at which he can collect images of slower growing species for several weeks. Although the heat and humidity suited to biofilm growth are less than ideal for cameras, he said the equipment is rated for more extreme conditions. The few cameras that have malfunctioned did so for a mechanical reason: The number of shots that he needs to document microbial behaviors is so large that the shutters on the cameras eventually break down after hundreds of thousands of clicks.